There’s a hot new Kentucky Derby candidate out there and his name is Bayern. Trained by Bob Baffert, Bayern shoved his way into the Derby picture with an eye-catching 15-length score in an allowance race at Santa Anita Park on Feb. 13. The son of Offlee Wild covered the one-mile distance in 1:35.77 that day and earned a 99 Brisnet speed figure for his effort. Needless to say, racing fans were all abuzz after the race — chief among them, Bob Baffert. 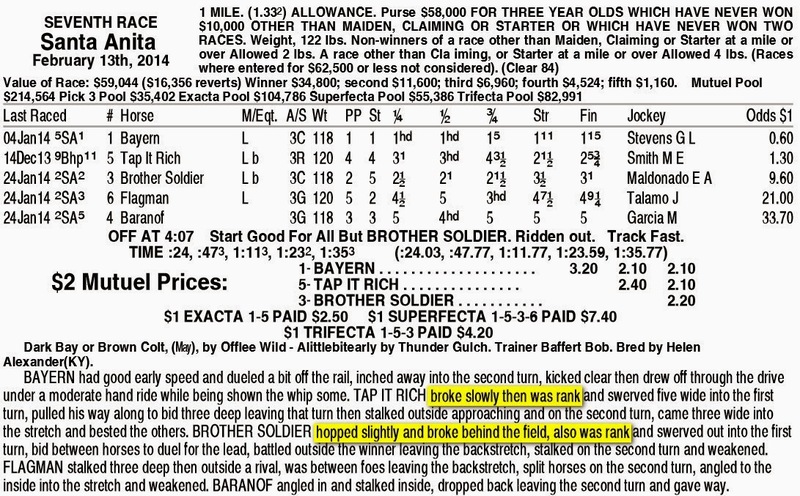 Look, I respect Baffert and I can certainly understand fans getting excited about a horse that won by such an impressive margin, but Bayern is no Derby candidate — at least not at this point. 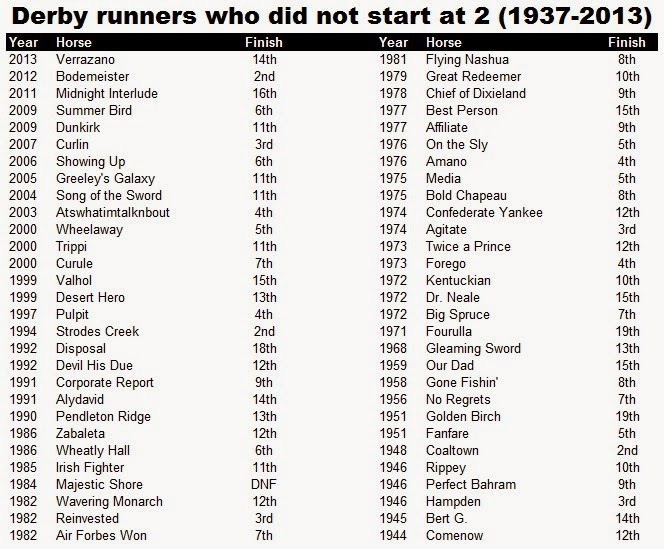 No, I’m not invoking the “Curse of Apollo” when I say that, although the fact that no horse has won the Run for the Roses sans a two-year-old campaign since Apollo in 1882 — the year outlaw Jesse James was killed — hardly inspires confidence. Although I’m sure the veteran jockey meant this as a compliment, to me, it was a huge negative based on what the race chart and my pace figures tell me. The fact is, Bayern ran evenly throughout on Feb. 13, which, as Huey Mahl pointed out in “The Race is Pace,” is the easiest kind of trip a horse can get. As you can see, Bayern was relaxed — so relaxed that I wouldn’t be surprised if he caught a few Z’s during the race. Of course, his catnap was aided by Tap It Rich and Brother Soldier, both of whom had trouble at the gate — and were anything but relaxed in the early going. And speaking of Tap It Rich, what does it say about the quality of the field when the second choice in the race — at 6-5, no less — was coming off a 52 ½-length drubbing at the hands of another Derby contender, Shared Belief? To me, it says that Bayern is a fraud — as phony as a sasquatch with a $3 bill (who’s ever heard of a $3 bill?). He may develop into something special, only time will tell. But, right now, he’s Verrazano II and I wouldn’t touch him in the Derby with a 10 ½-foot pole.